Apologies for my tardiness, this post really belongs about 5 months ago. I’ve had it knocking around in draft format for too long! As I have become fitter and more experienced I can now stand at the start of a sprint, knowing that I can complete the distance…. Don’t get me wrong. There’ still dozens of variables. But the terror of complete failure isn’t usually one of them anymore. Now, I have to say (and I never thought this would happen) that all these races are all becoming a bit…well samey. Not in a “this is boring to do” way, but more in a “this is boring to read about” way. So, dear readers, in an attempt to save you from this agony, I have pooled them all into a single post, which will hopefully allow me to highlight the differences instead of the similarities. During 2015 I participated in 5 sprint this. I told you about the Cherry Blossom Tri in my Spring Racing Roundup. Here’s the highlights of the other 4. The Kalrats sprint is a small friendly race and I went into it with no expectation. I hoped to try to go faster than usual, even though I hadn’t really been training for that. 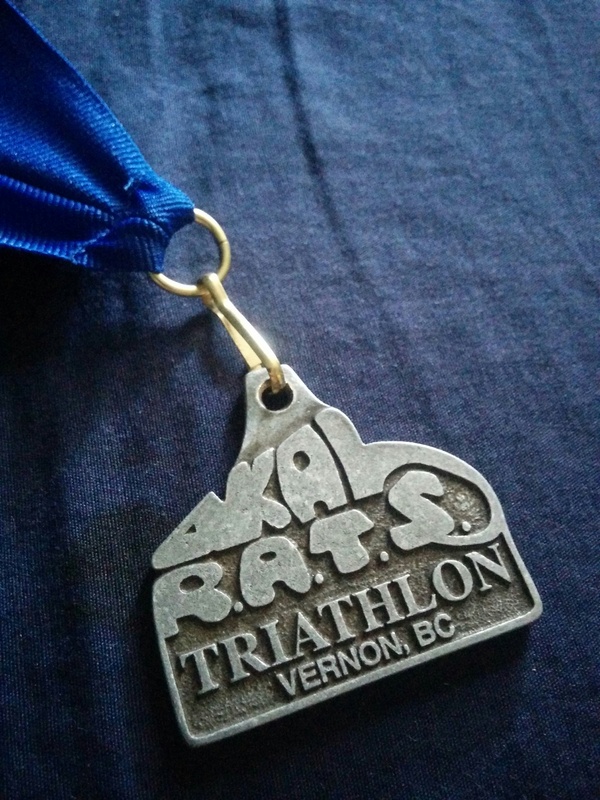 This was also the first race for the new wetsuit which I had finally purchased in preparations for Ironman Canada later in the year. I had been assured that wearing a wetsuit was much faster and easier. I can’t say I noticed a significant difference in my time, though it’s true that a saving of energy is difficult to quantify. I did however come out of the swim with more people around me as I headed out on the bike. I pedalled hard on the undulating bike course and marvelled at how fast I felt, I even overtook a few people (though not nearly as many as overtook me.) The race was going great. As I started the hilly run, I planned to run non-stop, which I did. I was quite sure that my time could be pretty good and I was right. 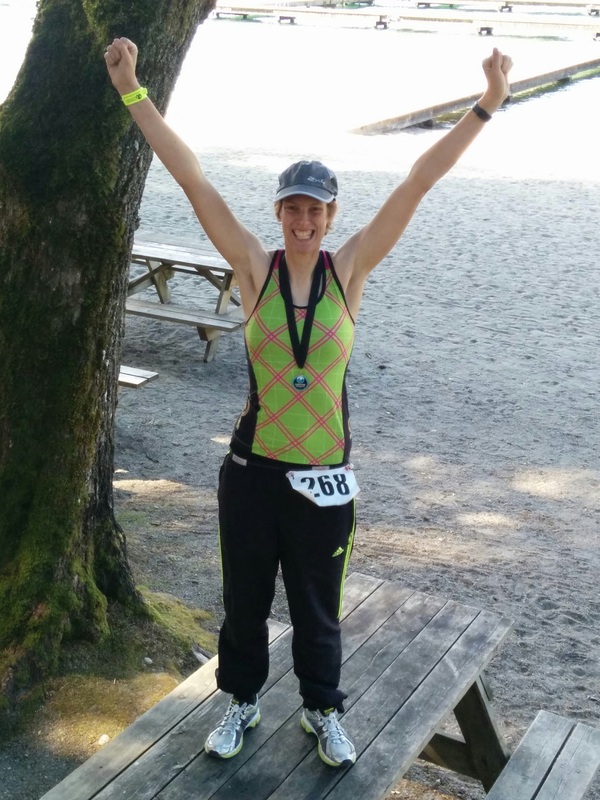 A PB and 2nd in my age group – my first medal! I had to keep going back and checking the timings sheet, I couldn’t quite believe it. The bike course in this tri is 18.5 km, so a little shorter than a standard sprint, but even so, I was happy with the time. I was happier though, with the feeling that I am actually beginning to become competitive, despite this being a smaller, local race. The bulk of the summer was then taken up in prep for ironman. Once that was done, I got to play at sprint events for the rest of the season. 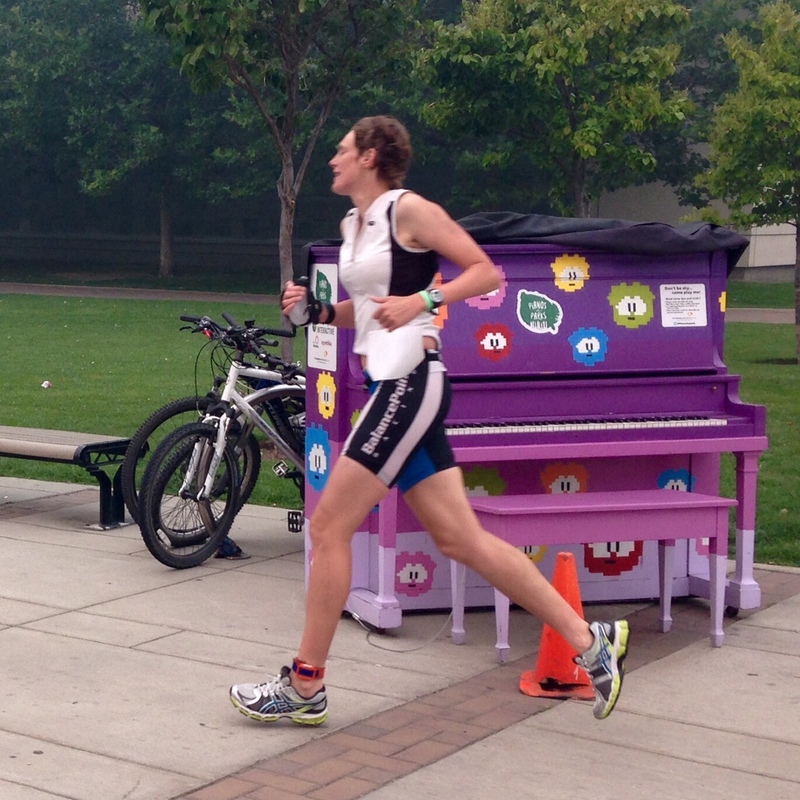 The first late season race was the Kelowna Apple Tri. This was the site of my first ever tri in 2012 and has been my barometer ever since. I didn’t know if these would be possible (not least because I didn’t know how well my body would have recovered from Ironman a mere 3 weeks before), but that was my aim. I spent the Saturday volunteering as an official with TriBC and encouraging competitions in the kids races. Later I racked by bike in transition, attended the athletes meeting (sadly I didn’t win the draw prize of a brand new bike) and then myself and some friends went out for dinner. The next morning I was up early to get to the site in good time. As I stepped out of my front door, I noticed a smoky smell. It was wildfire season, maybe there was a new fire? Then I turned toward the parking lot and couldn’t believe my eyes. Smoke hung in the air the mountains in the distance were nowhere to be seen. In fact, the buildings across the street were only partially visible. I had never seen anything like it. There should be a mountain back there! I ended up rushing to get to the start, jogging along the beach struggling to get into my wetsuit as the national anthem played (I apologise for the serious deficit in etiquette). I made it just in time and lined up along the water’s edge. As the start sounded, we all ran into the water and it was game on. I settled into a rhythm fairly quickly, picking off the buoys one by one. As I turned my head to breathe I could just make out the outline of the city skyline through the smoke, and a glowing red sun, trying to pierce through, as I swam on I marvelled at the beauty. I powered through the bike leg and to the run. I had been getting closer to consistently running under 30 min for 5K, and I hoped today I could do that. I had just bought a new Garmin 910XT marathon watch and technologically challenged as I am apt to be, I was struggling to use it. I had already failed to accurately measure the swim and bike portions, so the data was going to be limited. Thanks to SeeKayTri for snapping this pic! But right now, it seemed to be indicating that I was averaging well under a 30min 5K. A couple of kilometres later, I looked again. It still indicated sub 30. I looked at the clock but with the different wave starts, I wasn’t sure of my actual time. I sprinted the finish hard very fast. I felt sure of a good result. 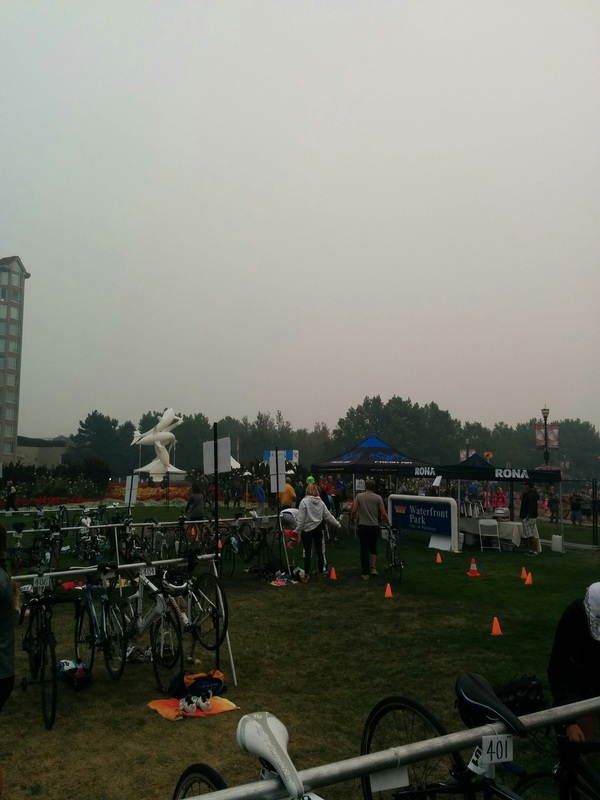 As the dust settled (if not the smoke!) and my friends began to appear. A definite perk of this local race. As the results were posted I was keen to see how I’d done. Target 1 – Under 1:30 – 1:29:01 CHECK! Target 2 – Run under 30 – 28:11 CHECK! For faster than I’d ever gone before! Target 3 – Top 10 in AG – 10th CHECK! just stuck in on that one, good thing Kay dropped out! This race passed so uneventfully I can’t even think of anything to write. Had a pretty good race and a great day out with some friends though. 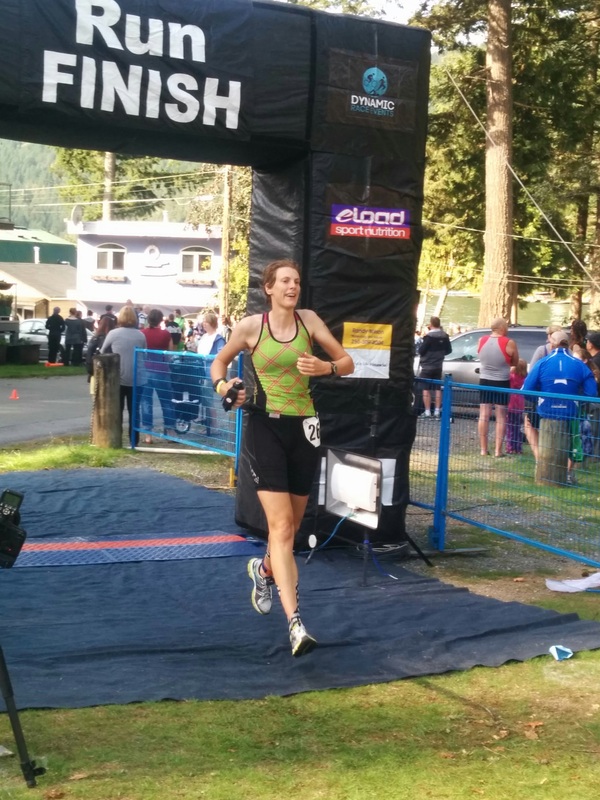 The last triathlon of my season was Cultus Lake. I like this little beginner friendly race, and as a bonus I have friends living in the area, so I get to visit at the same time. Friday night I drove the four hours to Chilliwack with my official cheering squad made up of friends Pat and Kim. We spent Saturday visiting and shopping, taking a couple of hours out to nip over to package pickup and listen to the athlete briefing. We went out for a buffet dinner that night, and then I finished up my prep for the race before heading for an early night. After an early breakfast, we headed over to the start and I racked my bike and set up my transition, I then paced around waiting for the start. I wrestled my way into my wetsuit, which I swear never gets easier. I then made my way down to the cool water of Cultus Lake. The swim didn’t feel very good. I spent the whole time alongside another swimmer, unable to drop her and occasionally sprinting to keep up with her. I was determined to stay with her, though eventually she got away from me right as we turned to the exit. I swam as close to the shore as possible, the water only a few inches deep before standing and hobbling across the rocky lake bed up to the beach. 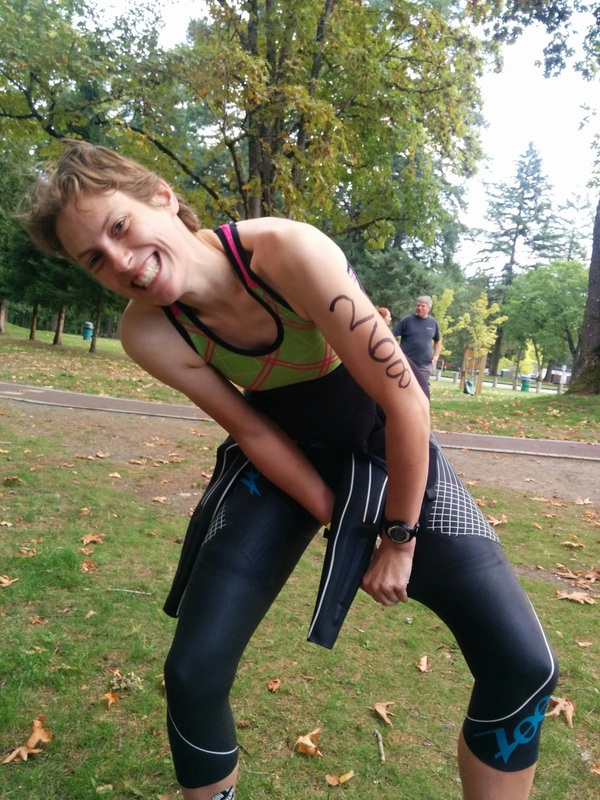 I jogged up to transition, dispensing with the wetsuit strippers and removing it myself once I got to my bike. I grabbed my helmet, put on my shoes and ran with my bike out to the mount line. Having completed this race last year I knew the course better this time and was better able to judge my effort. I pushed hard and before I knew it I was climbing the hill back up towards the lake and transition. Dismount, rack bike, helmet off, change shoes, water… go! I ran out of transition feeling great, but someone was yelling at me. I had forgotten my race number – a requirement on the run! I panicked for a moment, unsure of what would happen if I ran back over the timing mat to go fetch it. Concluding that I needed to do it either way, I dashed back to my bike. I grabbed the number, which was already attached to my elastic belt and ran back out, clipping it around my waist as I ran. I had wasted time, and now I compounded that mistake by starting the run way too fast. This made the second half of the run much harder than it should have been. I was very pleased to see the finish line when it came into view. I wanted to check the results as I hoped I had placed quite well, maybe even in the top three? When the paper was pinned up I scanned it for my name. Then I stopped. I called Kim over to check. I messaged Kay, just to be sure. First in my age group? I couldn’t believe it. We waited for the awards presentation and I collected my medal, a big smile on my face. 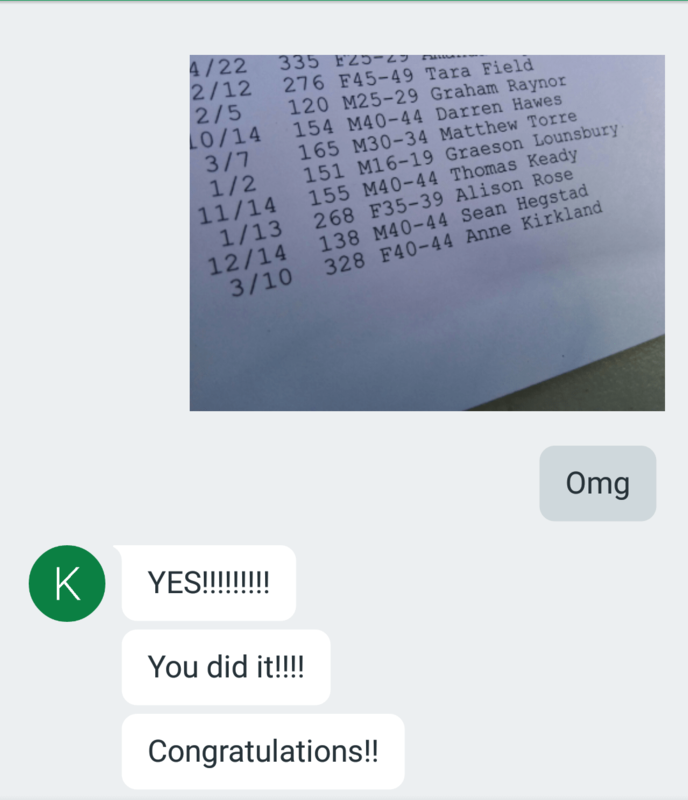 Sadly, a couple of weeks later when rechecking my results, I saw that there had been a correction; someone had been added before me. Their timing chip must have failed on the day.